With the ever-changing and escalating aftermath of the Khashoggi disappearance episode, there remain many fixed marks that are interesting to identify. But before we do, we must stop and briefly look at the official American, Turkish and Saudi stands on this issue. The Americans are best seen to be playing yoyo with their Saudi "friends". One moment they seem to be totally abandoning them and sending them spiraling down in a free-fall, and the next moment they lift them up, clutch them, and give them a sense of safety. Notwithstanding that on the 3rd of October, and just before the Khashoggi story hit the media frenzy, Trump reiterated that Saudi Arabia would not last two weeks without America&apos;s support, and what followed was a series of fluctuations and backflips on the American side. At the time of promising severe measures against the Saudis, Trump said that this will not mean canceling the arms deal with Saudi Arabia. And when Pompeo visited Al Saud to talk to the royals, leaving the Kingdom of Sand with an understanding that his boss Trump articulated by hinting at vindicating the royals and putting the blame on some rogue elements, America turned again supporting Turkish investigations and awaiting their outcome, but just before Erdogan&apos;s speech of the 23rd of October, Trump reiterated that he was prepared to accept the Saudi Government denial of involvement. And speaking of Turkish investigations, the highly awaited Erdogan speech ended in a pop and a fizzle, and was nothing short of a domestic propaganda speech that had no conclusions and did not provide any evidence as to the details of Khashoggi&apos;s disappearance and alleged murder. And "alleged" it remains until a body is found and identified by an independent reliable coroner. The speech was not endorsed by America, and America was for a few hours or so once again looking sympathetic towards the Saudi royals, but less than 24 hours later, Trump was talking about the "worst cover-up in history". There is no need to flood this article with easy-to-find references to substantiate the above. These swings that are extremely bizarre and hypocritical even by American standards make one wonders what kind of relationship do Saudis and Americans have. To understand the underlying nature of this relationship, having a look at the events of the last ten years or so are revealing enough without having to dig deeper into history. To this effect, I am not talking about the strategic alliances, defense agreements, the importance of oil to both countries, the world and the Israeli role in all of this. I am not talking about the Saudi obsession with Iran either. What I am talking about is the personal human relationships between the Americans and Saudis as human beings and how they view each other as men; this is about the personal love-hate-respect-loath relationship between American policymakers and their Saudi counterparts. This "relationship" is not a simple one. It is embroiled by deep cultural differences and belief systems. Having lived and worked in Saudi Arabia, I can understand the Saudi mindset more than many, but anyone who has had the same "privilege" that I had living there would concur, albeit not necessarily be prepared to sit down and write about it. 1. Contrary to the word of the Holy Quran and which clearly states that God chose the Arabic language for the religion of Islam, Saudis believe otherwise. They believe that Islam was God&apos;s gift to them. 2. Saudis also believe that God also gave Arabia another gift; petrol, and the biggest national reserve of them all … perhaps. 3. Al-Saud believe they have been afforded the God-given mandate to rule Arabia at the time when petrol became such an important commodity for the rest of the world. 4. Finally, the above "privileges" give Saudis, especially members of the Royal Family, an illusion of being above others. And this mindset views other nations from the perspective that Saudis are the rich masters of the world and that they have the power and ability to employ members of those other nations to "serve" them. When I lived and worked in Saudi Arabia, Saudis did not work. They had jobs, but they never really worked. Apart from the security apparatus whose job is mainly to protect the status quo of the Royal Family, the only other real working job that Saudis had was taxi driving. But that was what poor and uneducated Bedouins did. All other jobs from garbage collectors to doctors to dockyard engineers were contracted to expats from different regions of the world. Professional jobs that needed communication and fluency in the Arabic language were given to Lebanese, Syrians, Palestinians, Jordanians and Egyptians. Blue collar jobs were given to Yemenis and Arabs of the above nationalities without tertiary education. High ranking professional jobs that did not require fluency in Arabic were given to Americans and Europeans. This mentality produced a generation or two or three of Saudis who are filthy rich, overweight, and engrossed with self-grandeur and superiority that was fed time and time again by their financial prowess. But this is not restricted to Saudis only. Arabs of the UAE, Qatar, Bahrain and Kuwait all have that same superiority disease. Qatar that has a Qatari population of less than 200,000 has a population of over one and a half million expats to "serve them". This is exactly how they see it; themselves being masters, and expats beings serving serfs. In recent times, the Saudi and Gulf youth have increasingly been gaining tertiary education qualifications, receiving generous government scholarships and immediate employment following graduation. The Saudi Government protects its people by imposing quota rules on the percentage of Saudi employees in companies as well as the public sector of course. However, this fact has not been reflected in the work load they perform. These educated Saudis sit at the head of governmental positions and companies in tokenistic managerial supervisory roles over an entire staff of foreign professionals. They often try to assert their positions and feed their egos by yelling and barking irrelevant, and often laughable orders, at their employees and junior staff. And even if they are not in managerial roles, they will still be around the foreign professionals, leaving all the work for them to do and doing nothing themselves. Saudi professionals I "worked with" were living examples for me to learn this mindset. They did not lift a finger, but when a report was submitted by either myself or other expats around me, a Saudi name had to appear as its senior author, and he received all the accolade. Saudis genuinely believe that they can buy anything and anyone with money, including buying the stature of being a leading nation. And if, hypothetically-speaking, the Saudis were to contract a Western company to build them a space ship and send a man to Mars, they will regard this as a Saudi achievement. Surprised? Well, just have a look at Dubai&apos;s "achievement" in building Burj Khalifa, the tallest building on earth. Once again, that Saudi mentality is not any better or worse than the general oil-rich Arabian one. They are all almost identical. At a deep and subtle level however, the Saudis (and Gulfies in general) know well that in the eyes of the Empire and its cohorts, they are perceived as a bunch of "uncivilized camel riders" who happen to be horribly rich by sheer luck. They know that they are not really regarded as true allies of the West, but as its milking cow; and some Saudis and Gulfies are trying to change this image. None tried harder than Prince Bandar Bin Sultan. Prince Bandar Bin Sultan was Saudi Arabia&apos;s Ambassador to Washington from 1983 to 2005. He became the Saudi royal who best understood the Western mind and how the West regarded the Arab World, and especially Saudi Arabia. He had his own evil agenda he wanted to use to catapult himself into ascending to the throne as the first grandson of founding King Abdul-Aziz. He was a close personal friend of the Bushes and many others in the previous and successive American administrations. And, if America ever had a Saudi Prince that American lawmakers could speak to and reciprocate understanding with, it was Bandar Bin Sultan. He was banking on the fact that his father, Sultan, had been in line for the throne for decades and was Crown Prince ever since King Abdullah took the throne in 2005. But to Bandar&apos;s disappointment, his father died in 2011, before King Abdullah who died in 2015. As Bandar Bin Sultan was grooming himself to become king after his father, his knowledge of the Western mind and closeness to many key people in the United States led him to realize that he had to present himself as a competent and reliable partner in order to be respected. Bandar wanted to demonstrate his personal character worth to his American allies by plotting the "War on Syria". That war was his pet project and his license to achieve equality with his American friends. But Bandar fell on his sword when Syrian resistance proved to be much stronger than his ambitions, and not long after his failed desperate attempt to persuade America to attack Syria after he blamed the Syrian Army for a chemical attack that he staged in East Ghouta in September 2013, Bandar disappeared, vanishing into oblivion. With the rapid and unprecedented changes in the line of Saudi throne succession that followed Prince Sultan&apos;s death, and which eventually presented Mohamed Bin Salman (MBS) as the new Saudi strong-man Crown Prince, the young prince had big shoes to fill. Haunted by the image, ambition and failures of Bandar, MBS had a bigger "obligation" to prove his worth to his American "allies". The war on Yemen was MBS&apos;s own "love-child". He wanted to kill two birds with one stone; overcoming the Houthis, and proving to America that he is reliable in curbing Iran&apos;s regional influence. He was hoping he could prove that his army was able to fight and win a war against Iran itself. He thus gave his war a name akin to American military operations; "Operation Decisive Storm". Sounds a bit like "Operation Desert Storm", does it not? In doing this, he wanted to put himself on par with great military leaders and score a quick and decisive victory in Yemen. Three years later, he cannot even hold his own borders. In more ways than one, in as much as the Saudis and Gulfies have the afore-mentioned superiority complex, ironically they also possess a huge inferiority complex. They try to prove their own worth by bragging their "friendship" with America, and when President Trump made his first formal visit as President to Saudi Arabia, he was greeted like no other visiting foreign dignitary anywhere in the past. Only Elizabeth Taylor could claim such a reception as Hollywood&apos;s version of Cleopatra. Trump&apos;s visit was Saudi Arabia&apos;s greatest moment of "pride". But even on much smaller matters, Saudis and Gulfies brag their Western employees and they have a special liking for white blue-eyed Westerners. With thousands of Americans and Westerners working in Saudi Arabia and the Gulf, it would be rare, if not impossible, to find a black American/Westerner; especially if the post involves being in the public view. And this is because, if you are a Saudi employer and you need a Westerner to fill the position of a public relations officer, you would want a white, blue-eyed person on that desk and not a black person. After all, a black Westerner could be mistaken for a Sudanese, a Somalese or a member of any other "inferior" African nation; as perceived in the eyes of the Saudis/Gulfies. Back to the Khashoggi debacle and the role of Erdogan. As mentioned above, in his Tuesday the 23rd of October speech, Erdogan did not supply the goods, and it was time for America to pull the rug from underneath his feet, reclaim control of the narrative, and draw the Saudi yoyo back up again to give the Saudis a bit of a breather; until further notice. America can neither afford to keep the fate of the Khashoggi story in Erdogan&apos;s hands any more than it can afford to lose the Saudi milking cow. But the human relationships between Americans and Saudis are now perhaps at their worst, and mostly for the Saudis. The Saudis have again failed the validity and fortitude test and they know they have taken a back step that needs many years, perhaps decades to recover from. In the eyes of the Americans, their credibility as partners and viability as capable men has suffered a big time blow. The biggest twist perhaps in the Khashoggi debacle is that the Saudis have always felt that they were entitled to the same level of impunity the West affords to itself. After all, this was how Al-Saud got away with persecuting dissent, imposing undemocratic laws, and exporting Wahhabi ideology and the terror acts that come with it. Needless to mention the biggest human tragedy of them all; inflicting war crimes in Yemen, killing tens of thousands and inflicting starvation and disease upon millions others. But when America lifted the blanket of impunity on the Saudis over the Khashoggi story leaving them out on their own to face the consequences of their crimes for a change, the Saudis indeed did not survive for more than two weeks. Just imagine how would the world popular opinion could be manipulated if leading Western media outlets suddenly "decide" to start reporting the Yemeni tragedy and the role of Saudi Arabia in creating it, and specifically the role of MBS in creating this tragedy. Will MBS in this instance become the West&apos;s new Saddam? MBS has been named, his Foreign Minister desperately tried to isolate him from the Khashoggi story, but it is up to America and its "fake news" media to decide whether or not MBS is implicated, and the more they implicate him, the deeper America can dig into his pocket. And as this article was getting ready to be submitted for publishing, MBS himself broke his silence proclaiming that the murder of Khashoggi was a heinous crime and that those responsible will be punished. 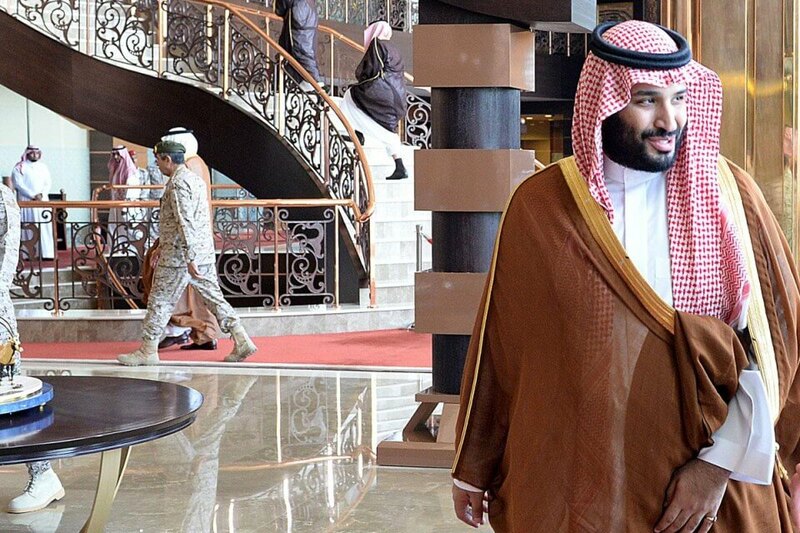 Either way, when the Saudis return to the negotiating table with their American "partners", MBS will not only be facing a bill for American protection of Saudi Arabia per se, but also a bill for protecting his own personal aspirations to become king as well as protecting his own head. He must prepare himself to expect a hefty price of his own head. What will that price be is yet to be seen.